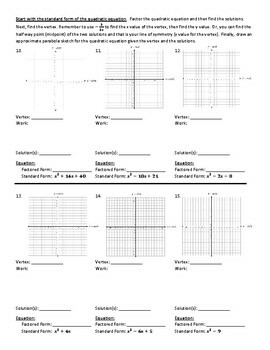 This worksheet is designed to tie in all of the concepts of solving quadratic equations. 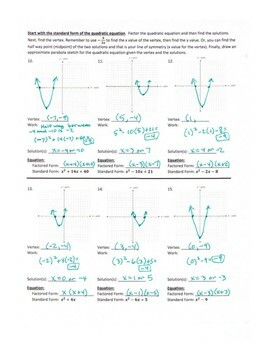 One of the things I found with my 9th grade Algebra 1 students was that they were not making the connection between graphs of parabolas, the solution of a quadratic equation and how it looked on a graph compared to how it looked in factored form, and the standard form of a quadratic equation. 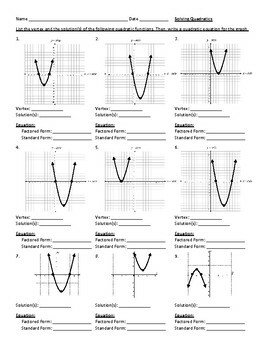 I created this so students would be able to start with a graph of a parabola, list the vertex and solutions, come up with the factored form, and then determine the standard form. I also wanted them to start with a standard form quadratic equation, factor it, find the solutions based on the factors, graph the solutions and then determine the vertex so they could sketch a graph of the parabola. On the front side, students start with the graph. They write the vertex and the solution, and then write the factored form of the equation based on the two solutions. I always teach students that the solutions are always opposite the factor - if a solution is at +2, then the factor is (X - 2). Finally, students multiply the two binomials together to get the quadratic equation using FOIL or the method they learned at the start of this unit. On the back side, the students start with the standard form of the quadratic equation. They factor it, find the solutions, and then graph the two solution. They then determine the vertex. They can either use -b/2a or find the half way point between the two solutions to get the line of symmetry/x value of the vertex. They then plug that number into the standard form equation (or the factored form) to get the y value. Finally, they draw a rough sketch of the parabola on their graph. I found this to be a powerful teaching tool in my Algebra 1 class. I saw a lot of light bulbs go on about how the graphs/factored form/solutions/standard form all tie in together and are interchangeable. Instead of seeing quadratics as separate skills, they see how everything connects. 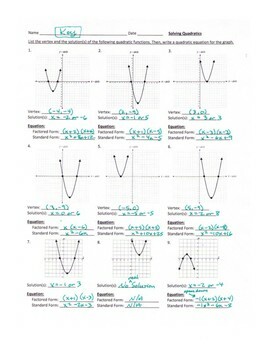 I have included an answer key with this worksheet.